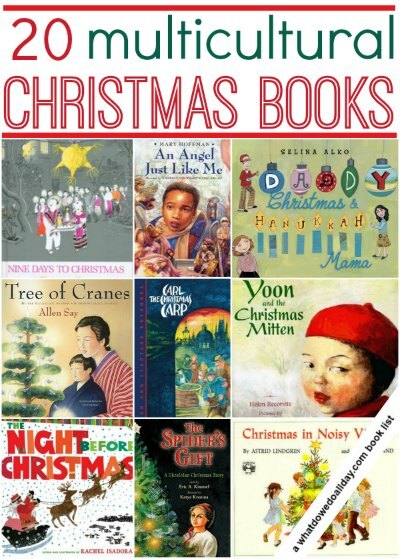 Multicultural Christmas books are a great tool to show children how people around the world celebrate the same holiday in different ways. Multicultural children’s books reflect a diversity of characters and traditions and teach kids to see them selves as part of a global world. Kids are naturally curious about different traditions and holiday picture books are a great way to start a conversation about diverse cultures and beliefs. These diverse books will take kids around the world to Europe, Africa, Asia and Latin America as well as show them the variety of Christmas celebrations in their own backyard. MORE: Want a family read aloud? see my list of Christmas chapter books. The Night Before Christmas. Isadora’s gorgeous cut paper collages transport Clement’s original Christmas poem to a small snow covered village in Africa. A dreadlocked Santa delivers African toys to kids but the book doesn’t come across as a forced relocation of the poem. I have several versions of Clement’s poem and this is a lovely addition to them. Christmas in Noisy Village. This is my favorite Christmas book of all time. I love the cozy, familial, Swedish traditions depicted in Wikland’s Carl Larsson-esque illustrations. Three sets of siblings set about getting ready for Christmas in a snowy landscape. They cut down a tree, make ginger cookies, wrap packages and play games. If you are like me and attracted to all things Swedish, be sure to take a look at my list of Swedish Holiday Picture Books. Daddy Christmas and Hanukkah Mama is on my list of Interfaith Holiday Books. My favorite part of this book about a mixed-faith family is that the two sides come together for a joyous blended celebration, as opposed to holding two separate celebrations – one for each side of the family. The family takes both Hanukkah and Christmas traditions and makes a new one. Tree of Cranes. Set in Japan, a young Japanese boy comes home with a chill. While he is warming up with a bath and a bowl of rice gruel he watches his mother fold origami cranes and dig up a small tree. She pots the tree and explains to her son that when she was growing up in California, “today was a special day” and together they light candles on the tree. The entire act of reading this book is so peaceful and relaxing. The Legend of Old Befana. In Italy, Befana brings gifts to children on Epiphany. When the Three Kings urge Befana to come with them to see the baby Jesus, she initially resists, insisting she must finish here sweeping. She decides to follow them, however, and as she travels she leaves gifts for children along the way. To this day, she continues to search for the baby King, following the star. I had never encountered this legend before, but I really love it, especially the idea that there is always a hope to find what you are looking for. Carl the Christmas Carp. This picture book will introduce kids to an unusual cultural tradition! In Prague, Radim and his father head to the market to buy the traditional carp for Christmas dinner. The catch (pun) is that the family keeps the carp in the bathtub, feeding it breadcrumbs, to fatten it up for the big feast. Radim, however, begins to get attached to the fish living in his tub and he and his friend, Mila, set the fish free in the local river. The 12 Days of Christmas. Like her book above, Isadora transports a traditional Christmas tale to Africa. Isadora designed the text to be read as a rhebus so even pre-readers can participate. Each item is given an African flair. For example, the five rings are women’s neck rings, the “maids a milking” are milking goats instead of cows, etc. Notes about traditions and geography are included at the end. What’s Cooking, Jamela? In South Africa, Jamela raises a special chicken but then she finds out it is headed for the pot to become Christmas dinner! Jamela takes the chicken and runs away through the town. Finally everyone agrees, you don’t eat your friend and a hearty vegetarian meal is prepared instead. Local words are sprinkled throughout the text (glossary provided). Yoon and the Christmas Mitten. Why are wonderful books like this out of print! It makes me so frustrated. You should be able to get a copy at your library. My youngest keeps asking for this book even though Christmas is still a ways off. Yoon and her family are recent Korean immigrants. Yoon learns about “Mr. Santa Claus” in school but her parents insist they are “not a Christmas family.” Yoon can’t help but hope, though, that Mr. Santa Claus will pay her a visit. What I love about this story is how the family members show each other respect and how Yoon’s parents, even though they originally rejected the idea of Christmas, listened to Yoon’s reasoned arguments and surprised her. The Legend of the Poinsettia. Lucida’s mother is weaving a beautiful new blanket for the church when she falls ill. Lucida is determined to finish the blanket, but instead she tangles up the weaving. When the villagers join the procession of gifts to the manger in the church, Lucida watches in the darkness, feeling as if she has ruined everything. An old woman tells her that the Baby Jesus will love any gift she brings so Lucida carries an armful of weeds and offers them up at the manger, where they turn into poinsettias. The Night of Las Posadas. I hope I’m not showing too much favoritism by having three dePaola books on the list! In Sante Fe, New Mexico, Sister Angie is helping to prepare for the nativity play during Las Posadas. Angie falls ill and cannot make it to the performance but it turns out beautifully with the help of a small miracle. Too Many Tamales. My mother used to work with a woman who made and sold tamales during the Christmas season and my mom would always buy masses of them. They were sooooo delicious. In Too Many Tamales, Maria finally gets to help assemble the traditional tamales for the holiday feasts but in doing so she loses her mother’s ring — or so she thinks — in the mixture. The only way to find the ring is to eat the tamales, of course! Nine Days to Christmas: A Story of Mexico won the 1960 Caldecott. Ceci is so excited to choose a piñata for her first posadas celebration in Mexico. She choses the Star of Bethlehem but when it comes time to break it, she doesn’t want to! It is finally smashed by the other children and when it opens a lovely miracle happens as the sky fills with stars. The Spider’s Gift: A Ukrainian Christmas Story. It’s embarrassing to admit, but I do have a hard time reading any books about spiders. You don’t have to tell me how pathetic I am. I already know. Katrusya’s family is too poor to buy each other gifts for Christmas but she does manage to secure a tree. It turns out the tree is filled with spiders. Her mother wants to get rid of the tree (seems reasonable to me!) but Karrusya convinces her to keep it and in return the spiders decorate it with their webs. A Christmas miracle turns the webs to silver and brings riches to the villagers. Everett Anderson’s Christmas Coming. I love this story about a young boy who watches snow falling from his 14th story window and explores the holiday festivities in the city. There are delightful details that urban dwellers will appreciate, like how to get a tree in an elevator and what the neighbors think of the party happing upstairs. Sadly, this book is out of print, but look for it at your library, it’s well worth the effort of tracking down. Read my full review at Storied Cities. Grace at Christmas. Christmas is Grace’s favorite holiday and she is way of sharing it with her grandmother’s friends from Trinidad. She especially doesn’t want to share her room! Things turn out okay, though when Grace makes a new friend, the Christmas play benefits from extra actors and a very special guest arrives! La Noche Buena: A Christmas Story. Nina is experiencing Christmas in Miami with her Cuban relatives. It is very different from the snowy, cold New England celebrations she is used to. There is a lot of food preparation! But also a bit of dancing, music and lots of family. Grandma’s Gift. Artist Eric Velasquez remembers a special moment with his grandmother. Over winter break and against the backdrop of preparing for a traditional Puetro Rican Christmas celebration, a boy and his grandmother visit the Metropolitan Museum of Art for a school project. Eric is inspired when he sees the paintings of Diego Velasquez and realizes he can be an artist too. This is probably better for older kids, ages 7 and up. N is for Navidad. A family prepares for the Christmas celebration in this rhyming alphabet book. Each letter is given a Spanish word, from ángel to iglesia to zapatos. A glossary is included. MORE: See the index of all my book lists. « Train Gifts for Kids: Books, Toys and Games! I think my comment disappeared but if not, I apologize if I am posting this twice. Who knew that there was more than 1 book about putting a carp in the bathtub and then killing it for a holiday feast?!? The other (or should I say, one other?) is my favorite Passover book ever, Barbara Cohen’s The Carp in the Bathtub. And the Yoon book reminds me of Rivka’s First Thanksgiving, which I hope to write about today, in which an immigrant child persuades her elders to celebrate an American holiday. There are also some super crazy YouTube videos people made with their carp in a bathtub! I love Rivka’s First Thanksgiving but I didn’t make the connection between it and Yoon. I bet there are others with a similar theme, too. What a great list. I’m posting this on our library Facebook page. Thanks for this great list of books -a wonderful resource. Very nice list, and I am gratified to see that we read almost every single one on your list except the carp and the Ukranian story. We did read The Cobweb Christmas that has exactly same story, but set in Germany 🙂 I would add Uncle Vova’s Tree by Patricia Polacco to this list. I loved Too Many Tamales. I used to eat them on Christmas morning because one of my best friends growing up is Mexican. A lovely tradition!! I thought about that! Do you have any suggestions. The only one I could think of was Christmas Wombat. Wombat Devine by Mem Fox is a Christmas favourite of ours. You are my hero! Great list here but what really got me is Nine Days to Christmas: A Story of Mexico. I had a vague memory of this from 3rd grade and now, here it is! Thank goodness they haven’t changed the cover. Thanks so much! I’m glad I could remind you of an old favorite. Thanks so much Erica for sharing your wonderful lists on The Multicultural Children’s Book Day link up! We really appreciate your contributions! Another fantastic list Erica! I can’t wait to check many of these out. What a wonderful list of great books. Thank you for sharing! I’m so excited that you posted this list! Requesting as many as I can from our library to read this month. Thanks! Thanks so much for linking up to Multicultural Children’s Book Day linky! We are so excited that you will be joining us on January 27th! My daughter is 18 months and loves books. This year will be the first of many holiday traditions, and I wanted a Christmas book for every day of Advent. I just ordered several of these from the used section of Amazon! Thanks so much! Fabulous list! Thank you! I’m a great lover of children’s books and especially Christmas books–and I love books that are multi-cultural!